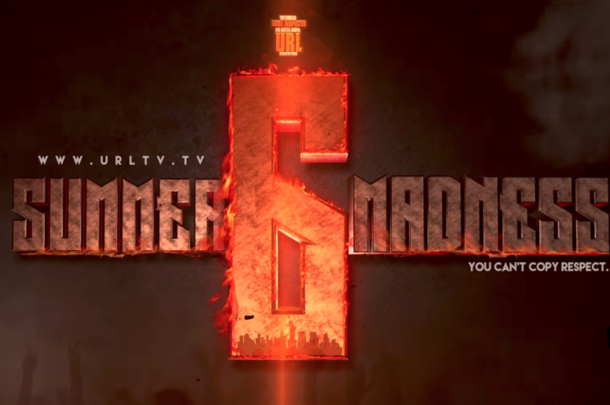 This weekend, URL will present its flagship event, Summer Madness featuring a card lined top to bottom with some of the biggest names in the battle culture. From vets returning to the platform, to hungry emcees looking to further cement their place on the URL stage, it's a card with a bit of everything. 1. A fully Reloaded Hitman Holla vs a supremely motivated K Shine. Hitman Holla's return to battle rap has been met by a mixed response from fans. Hitman's extended break from battles has required he play catch up and I think he will finally display the trademark stage ownership that has made him so iconic. K Shine conversely has wanted this battle for entirely too long. He knows he is regarded as one of the great performers in Battle Rap and has to feel like Hitman is the opponent that can cement this sentiment. The creativity that he has added to his repertoire since joining NWX may reach an all time high vs Hitman. I'm expecting something we have never seen before from K-Shine. - I expect Rain to play some kind of role in this battle, tracing back to an altercation between NWX and Team St. Louis at Double Impact, the hilarious where's he at live videos that Hitman and Rain posted, the rumored cancellation and then restoration of this battle to the card all point to URL mainstay and NWX member Rain having some kind of impact on this battle. 3. Hollow breaking down Roc piece by piece. Battling Hollow Da Don is a guarantee that at some point the opponent will be forced to look at themselves in the mirror. Leading up to the event Hollow has dropped blogs and tweets that point at Roc's character being in question. The history of Hollow in big battles only reinforces that fans are going to made to look at Tay Roc in a light they never have before. Hollow has been surgical when leading up to battles often taking shots that most battlers would save for their rounds. Only to see later that his material is even more potent than his pre-battle jabs. 4. Tay Roc's second round roomshaker. It's almost becoming a URL big stage tradition now. The first round of a Tay Roc battle is like a warm up for what is next to follow. Tay Roc has consistently delivered forceful, aggressive, impactful second rounds that change the climate of a battle entirely. Tay Roc second rounds seem to rattle every opponent that has to deal with them. I'm looking forward to Tay Roc keeping this tradition of delivering a solid 1st and then proceeding to bring a level of aggression and ferocity to his 2nd round that Hollow will be hard pressed to match. 5. Do JC and the big stage belong together? We finally get to find out. JC's climb to the biggest stage has been quite a journey. He now makes his Irving Plaza debut facing an opponent that has touched the stage twice in a remarkably shorter period in comparison. Does the bravado, wit, patience and pace of JC's pen translate? Will JC attempt to change his approach facing the monster that is the Irving Plaza audience? How will he handle the first inevitable dry spot? If JC clears these hurdles, victory is almost certain. The fans have waited too long to see JC here, if his mettle is a match we are in for probably one of the best debuts on URL's main stage in Battle Rap history. 6. Where can Rum Nitty go from here? Rum Nitty has cemented himself as one of the top punchers in Battle Rap, and if he were voted #1 currently, it could also be accurate. His capacity for short circuit inducing, collar grabbing, yo did you hear that bars seems to be unmatched. Well until now. JC is no slouch lyrically. Walking into a match facing an opponent of equal or possibly greater pedigree can be daunting. Rum Nitty is no stranger to the monster of Irving Plaza or the URL big stage. He's proven to be a force on the small stage via Born Legacy. He earned his keep vs Clips, improved and experimented vs Tay Roc, and then delivered the composure and ferocity necessary for Irving at Double Impact 2. The culture knows that Rum Nitty won't cave to the pressure of the stage. What I expect to see is Rum Nitty look to separate himself from the pack and join the elite. 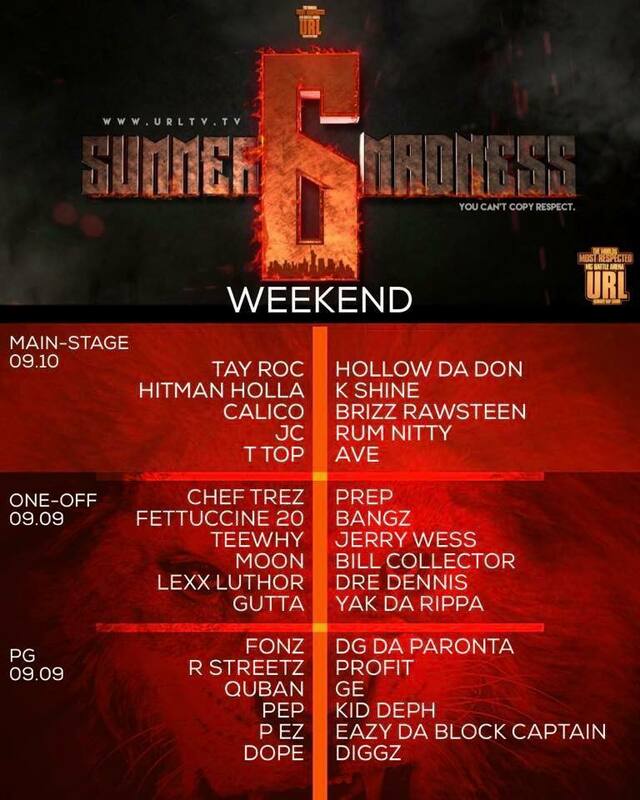 Study Calicoe's history and realize that he has quite a spectrum of battles on the Summer Madness stage. His resounding victory vs a rattled Math. His culture changing clash vs Loaded Lux. And sitting right in the middle? A pretty good back and forth vs Tay Roc. Calicoe battling on URL always feels like a return. Do we get a Calicoe that cares enough to attack Brizz? Does he take Brizz to be an actual threat? I don't know, but I'm certainly always excited to see what version of Calicoe we are going to see. Will he be all out disrespect like vs Pat Stay and Tay Rock? Will he make a statement about his authenticity vs the facade portrayed by other battle rappers? I'm hoping he does both and turns in a classic Calicoe performance. 8. Is Brizz out of Hash Browns? Brizz Rawsteen has been my personal pick to rise the ranks since my first live sighting of him vs Young X. His skill set, vocal tone and energy make for great attributes for star power. He is now a star. Capable of one off moments that eclipse the battle they took place in. When you are able to do this, the only downside is that fans want it again, and again, and again. I don't think Brizz is done shaking rooms, and Calicoe is a great opponent to test Brizz's creativity. I advise watching his rounds with 5 to 7 feet of free space available for violent reactions. 10. When T-Top talks to Ave, the fans are gonna be like"....?" T Top has made personal conversation a staple of his material. When T Top talks to his opponents about their dirty laundry it almost always seems to land. Outside of vs Goodz, T-Top has consistently counseled every one of his opponents on the big stage. And it has worked to great effect. His epic breakdown of veterans is basically an expected portion of his material. And it doesn't matter if the subject has been mentioned before, because no one does it like T-Top. We know that T-Top will solidify his realness, we know that T-Top can out struggle a hostage tied in loose rope. What we don't know is if T-Top's angle for Ave will be enough to overcome Ave's desire to reclaim the prestige he once had.